When you need to select a hose, use S.T.A.M.P.E.D. to makes sure you get what you need! 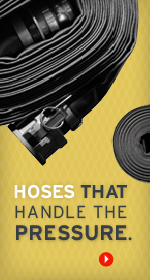 Selecting the correct hose and fittings reduces the risk of hose failure due to misapplication. 'T' Temperature Maximum & minimum temperature of the product conveyed through the hose assembly (i.e. 200°F). 'A' Application Describe the actual use of the hose (i.e. Indoor/Outdoor use, intermittent or continuous use, flexibility needs, etc.). 'M' Material Conveyed What substance or material is being conveyed through the hose? Wet/dry, particle sizes, chemicals? (i.e. compressed air, water, a specific chemical, product, or material conveyed). 'P' Pressure The pressure or vacuum at which the material is being conveyed through the hose assembly (i.e. 100 psi). 'D' Delivery Date the product is required (i.e. June 6, 2014). Once the information in the acronym “STAMPED” referenced above is obtained, it is essential that a hose and coupling combination meet all of the “STAMPED” requirements as recommended by the manufacturer. All customers are responsible for supplying Apache Inc. with correct information regarding size, temperature, application, material conveyed, pressure, ends and delivery as set forth above. Customers are also responsible for advising Apache Inc. of any changes in that information which arise, for whatever reason, in their process, equipment or any changes in the specifications for the size, temperature, application, material conveyed, pressure, ends, or delivery dates. Always use the printed information from the manufacturer to ensure accuracy of any recommendation. Do not exceed the printed, recommended service criteria. It is the ultimate objective to obtain maximum safe service life for a product; to accomplish this Apache recommends the user maintain specific care during the use of the hose assembly to ensure continued safe operations.